DataGenerator generates data records using transformation. The component can send different records to different output ports using Return Values of Transformations. DataGenerator does not propagate metadata. Datagenerator has no metadata template. Output metadata fields can have any data types. Metadata on output ports can differ. Definition of the way how records should be generated; written in the graph in CTL or Java. The name of an external file, including path, containing the definition of the way how records should be generated; written in CTL or Java. Generator class  The name of an external class defining the way how records should be generated. Number of records to be generated. A negative number indicates that the number is unknown at design time. See Generating Variable Number of Records. String consisting of all fields of generated records that are constant. It does not contain values of random or sequence fields. For more information, see Record Pattern. 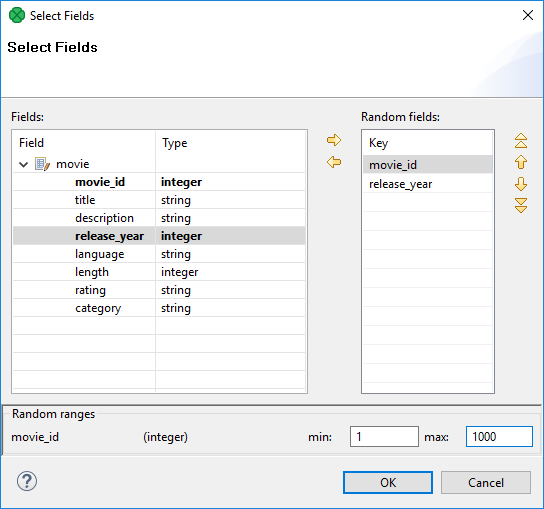 User should define random and sequence fields first. For more information, see Random Fields and Sequence Fields. Sequence of individual field ranges separated by a semicolon. Individual ranges are defined by their minimum and maximum values. Minimum value is included in the range, maximum value is excluded from the range. Numeric data types represent numbers generated at random that are greater than or equal to the minimum value and less than the maximum value. If they are defined by the same value for both minimum and maximum, these fields will equal to such specified value. Fields of string and byte data type are defined by specifying their minimum and maximum length. For more information, see Random Fields. Example of one individual field range: $salary:=random("0","20000"). Fields generated by a sequence. They are defined as a sequence of individual field mappings ($field:=IdOfTheSequence) separated by a semicolon. 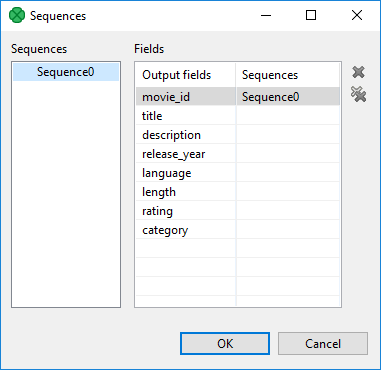 The same sequence ID can be repeated and used for more fields at the same time. For more information, see Sequence Fields. Sets the seed of this random number generator using a single long seed. Assures that values of all fields remain stable on each graph run. Random seed influences field values generated using the Random fields attribute only. It does not affect values generated using the Generator, Generator URL or Generator class attributes. To set a random seed there, use the setRandomSeed() function. One of these transformation attributes should be specified instead of the deprecated attributes marked by number 2. However, these new attributes are optional. These attributes are deprecated now. Define one of the transformation attributes marked by number 1 instead. 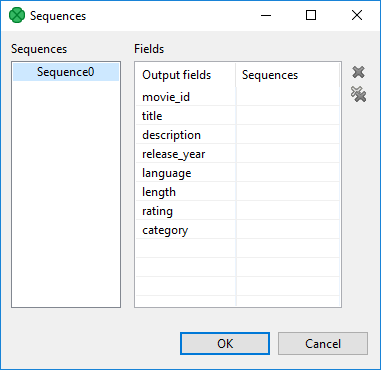 DataGenerator generates data according to a pattern instead of reading data from a file, database, or any other data source. To generate data, a generate transformation may be defined. It uses a CTL template for DataGenerator or implements a RecordGenerate interface. If you do not define any of these three attributes, you can instead define the fields which should be generated at random (Random fields) and by sequence (Sequence fields) and fields that are constant (Record pattern). Record pattern is a string containing all constant fields (all except random and sequential fields) of the generated records in the form of a delimited (with delimiters defined in metadata on the output port) or fixed length (with sizes defined in metadata on the output port) record. This dialog consists of two panes with all graph sequences on the left and all Clover fields (names of the fields in metadata) on the right. Choose the desired sequence on the left and drag and drop it to the right pane to the desired field. The dialog contains two buttons on its right side. For canceling the selected assigned mapping or all assigned mappings. Remember that it is not necessary (although possible) to assign the same sequence to different Clover fields. This attribute defines the values of all fields whose values are generated at random. For each of the fields you can define its range (i.e. minimum and maximum values). These values are of the corresponding data types according to metadata. You can assign random fields in the Edit key dialog that opens after clicking the Random fields attribute. There are the Fields pane on the left, the Random fields on the right and the Random ranges pane at the bottom. In the last pane, you can specify the ranges of the selected random field. There you can type specific values. You can move fields between the Fields and Random fields panes as was described above - by clicking the Left arrow and Right arrow buttons. You can specify a transformation using CTL in Generator or Generator URL attributes. This can be done using the Transformations tab of the Transform Editor. However, you may find that you are unable to specify more advanced transformations using the easiest approach. In such a case, use CTL scripting. This transformation template is used only in DataGenerator. Once you have written your transformation in CTL, you can also convert it to the Java language code by using a corresponding button at the upper right corner of the tab. Description Initialize the component, setup the environment, global variables. Invocation Called before processing the first record. Integer numbers. For detailed information, see Return Values of Transformations. Note that when Generating Variable Number of Records, STOP is NOT used to indicate an error, but to finish the generation successfully. Defines the structure and values of all fields of output record. If generate() fails and the user has not defined any generateOnError(), the whole graph will fail. If any part of the generate() function for some output record causes fail of the generate() function, and if the user has defined another function (generateOnError()), processing continues in this generateOnError() at the place where generate() failed. The generateOnError() function gets the information gathered by generate() that was received from previously successfully processed code. Also an error message and stack trace are passed to generateOnError(). Returns Integer numbers. For detailed information, see Return Values of Transformations. Invocation Called if generate() throws an exception. Defines the structure and values of all fields of an output record. Prints an error message specified and invoked by the user (called only when either generate() or generateOnError() returns a value less than or equal to -2). Invocation Called in any time specified by the user. May be used to allocate and initialize resources required by the generate. All resources allocated within this function should be released by the postExecute() function. Invocation Called during each graph run before the transformation is executed. Description Should be used to free any resources allocated within the preExecute() function. Invocation Called during each graph run after the entire transformation is executed. Output records or fields are accessible within the generate() and generateOnError() functions only. All of the other CTL template functions do not allow to access outputs. Remember that if you do not hold these rules, NullPointerException will be thrown. The transformation implements methods of the RecordGenerate interface and inherits other common methods from the Transform interface. See Common Java Interfaces. You can use Public CloverDX API, too. Initializes generate class/function. This method is called only once at the beginning of the generate process. Any object allocation/initialization should happen here. Performs generator of target records. This method is called as one step in generate flow of records. This method allows to distribute different records to different connected output ports according to the value returned for them. For more information about return values and their meaning, see Return Values of Transformations. Performs generator of target records. This method is called as one step in generate flow of records. Called only if generate(DataRecord) throws an exception. Method which can be used for signaling into generator that something outside has happened. Method which can be used for getting intermediate results out of generation. May or may not be implemented. Sometimes the number of records to be generated is not known at design time. In such a case, set the value of the Number of records to generate attribute to a negative number. The component will then generate records until the generate() function returns STOP (in this case, it is not considered an error). This works for transformations defined both in Java and CTL. Note that in the last iteration when STOP is returned, no records will be sent to any of the output ports. Sometimes you need to generate random values in a graph and it should be possible to rerun it again returning the same values. This might be useful, for example, for tests. The solution is to set the random seed for random number generator to some fixed value. If Generator URL is used, we recommend users to explicitly specify Generator source charset.